It's been another exciting week at the I'm So Vintage homestead. Life on the prairie (okay it's an apartment in Kentucky) is an unrelenting round of good times. So here is a glimpse into what I've been up to. I talked about juicing here. Sometimes I throw in everything but the kitchen sink. I like to make sure I use up all of my veggies, and since I wrote that first post I have added turmeric. Great anti-inflammatory. As the weather has turned more fall like here, I am starting to become interested in baking again. Got up early Sunday morning and baked some gluten free banana muffins. 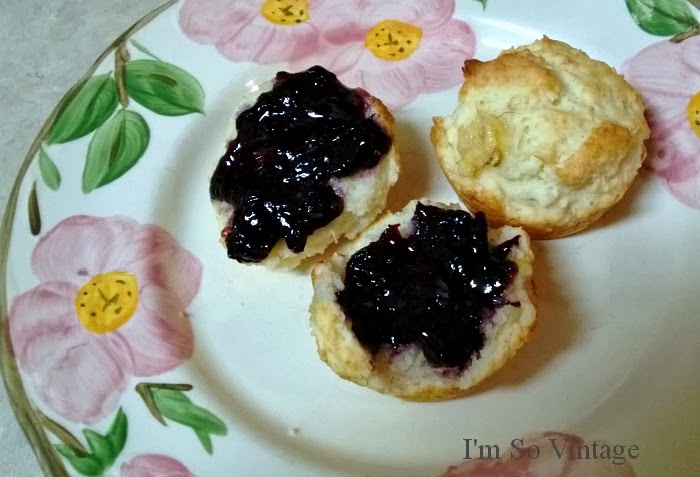 Topped with fresh blueberry preserves, they were YUM!!! 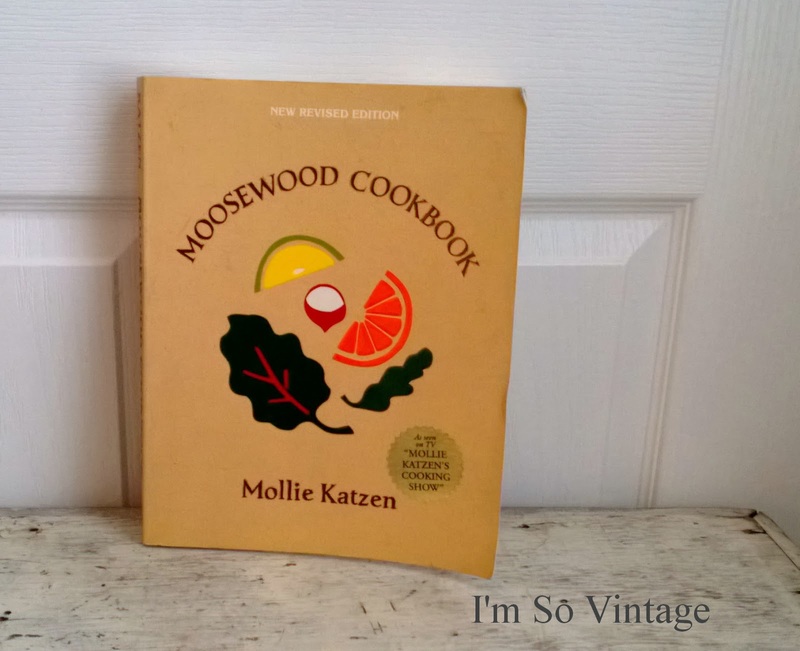 I have really been wanting a Moosewood cookbook and last week while out thrifting, one was just sitting on a shelf all by its lonesome. I think it moved itself over there from the book shelves because it knew I didn't have time to go through all of those books. For $2.50 I did a happy dance all the way out the door. I cooked up some cauliflower and cheese soup and a mushroom and swiss quiche this week. I used a frozen gluten free pie crust I found at Whole Foods. More YUM!!! My week has not been just about food, although my scales would beg to differ. While cleaning out a summer handbag I found these heart shaped stones. And my favorite auction find of the week. I have to confess I drove 12 miles just to bid on this. It will be going in my shop, but in the meantime I will enjoy looking at it. Time to get out there and look for the next great find. So happy to meet you, Jody. such a happy happy post full of yumminess, prettiness and lovely words,! Thanks, Diana, I think I should have considered losing a few pounds before the onset of the cold weather. Laura... those muffins look positively delish. Love the pitcher too. Muffins were delish. Didn't last long. Mom came over and snuck a few out in her handbag. Those muffins look wonderful! Have you posted the recipe? And the juicing sounds like a great idea - especially with the addition of turmeric. Which reminds me, I've got sweet potato fries in the oven, sprinkled with Penzey's Hot Curry Powder (with turmeric.) Pretty pitcher you found!! I used a muffin recipe and substituted gluten free flour and added bananas. Turmeric is so good for you. I'll have to go read your post about juicing. I'm trying to live much healthier! 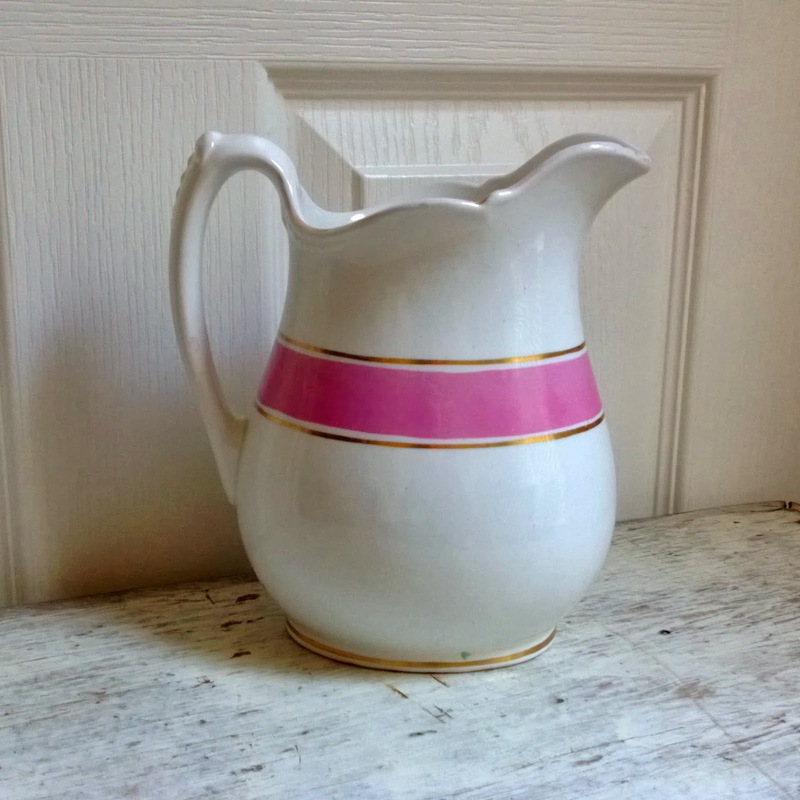 Love that pitcher, so very pretty! Happy Fall! My blood pressure was consistently really high, but juicing brought it down to normal, Linda. I have read that juicing does a body good..I'd like to try it, but will need a juicer. This time of the year stirs up interest for baking... Happy baking! My younger sister bought me my juicer on Ebay. She got it for $12 and it has never been used. Try there, if you are looking for one. I really need to juice too, but all I have is a very old blender that barely blends! I have a couple of the Moosewood cookbooks...love them. See my previous comment about the juicer. It has proven to be one of the best gifts I have ever gotten. Good for you with the juicing. Lot's of energy and great vitamins. That pitcher is so cute with it's hot pink stripe. Great score. Are you sure you want to sell it. I think it is a keeper!!!! Well, Christmas is coming up so I guess I need to sell it. I do love it though. I always love finding heart shaped stones! Glad you found those. Such a nice surprise! I know, Michelle. I always love finding the heart shaped stones. I need to try juicing myself. I think it might perk me up. 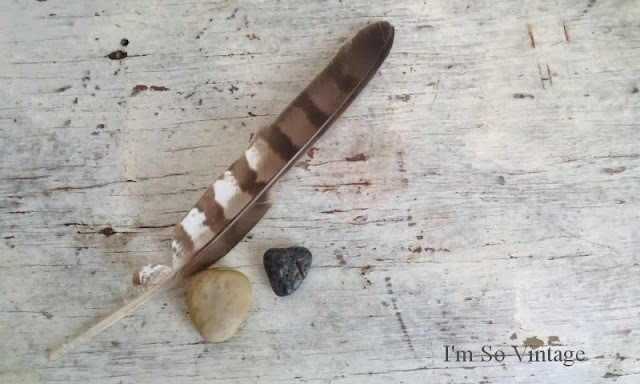 It definitely perked me up. Beth. I've never heard of a Moosewood Cookbook. I'm going to have to go look that up. Good going on the Juicing! Thanks, Kim. Great vegetarian cookbooks. Starting with the juicing really gets my day going.The cookbook I got was from 1993. I'm on the lookout for others now. Love the pitcher! I've never tried juicing. I do eat a lot of fresh fruits and veggies though. 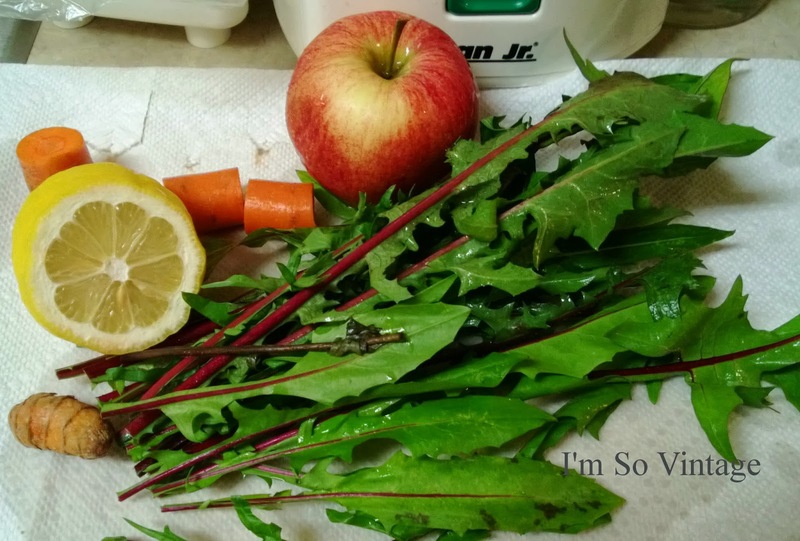 I normally eat lots of fruit and vegetables, but I wanted the dandelion greens, which are pretty bitter. The lemon helps with that. Those muffins looks so yummy!